Residents and beachgoers were excited about the project. 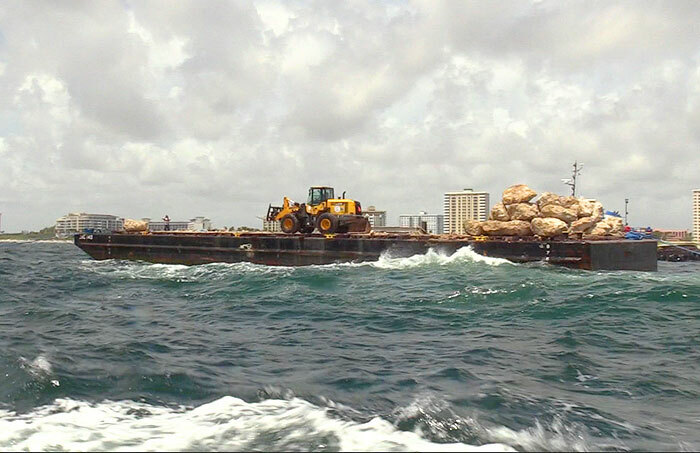 Placing the artificial reef is good for tourism, divers and nature. The underwater ecosystem off the Boca Raton coast will get an environmental boost from the newly created structure. The man-made reef is meant to recreate a lost nearshore habitat for juvenile marine species transitioning from the Intracoastal Waterway to Boca’s offshore reefs. The artificial reefs will help make up for the habitat lost when sand washes over natural reefs. The new structures attract fish and other reef-dwelling organisms to the area, and create scenic underwater attractions for divers and snorkelers. Funded in part by a Florida Fish and Wildlife Conservation Commission grant, the sinking marked the third artificial reef placed in Boca Raton. This latest amenity also adds to more than 150 artificial reefs already placed in the waters off Palm Beach County. The two reefs created are located at the GPS coordinates 26 20.537, -80 03.890 and 26 20.553, -80 03.888.